In this guide we will be configuring the simplest possible Kubernetes cluster consisting of two nodes. The first node with hostname kubernetes-master will act as the master node. The second node with hostname kubernetes-master also running Ubuntu 18.04 will be a slave node simply joining the Kuberneets cluster. Once we get the Kubernetes cluster up and running as a proof of concept we will deploy a Nginx server container. NOTE: At the time of writing only Ubuntu 16.04 Xenial Kubernetes repository is available. Replace the below xenial with bionic codename once the Ubuntu 18.04 Kubernetes repository becomes available. $ sudo apt-add-repository "deb http://apt.kubernetes.io/ kubernetes-xenial main"
Lastly, it is worth to mention that all your nodes should have an accurate time and date, otherwise you will run into trouble with invalid TLS certificates. Kubernetes on Ubuntu 18.04 master node is now initialized. 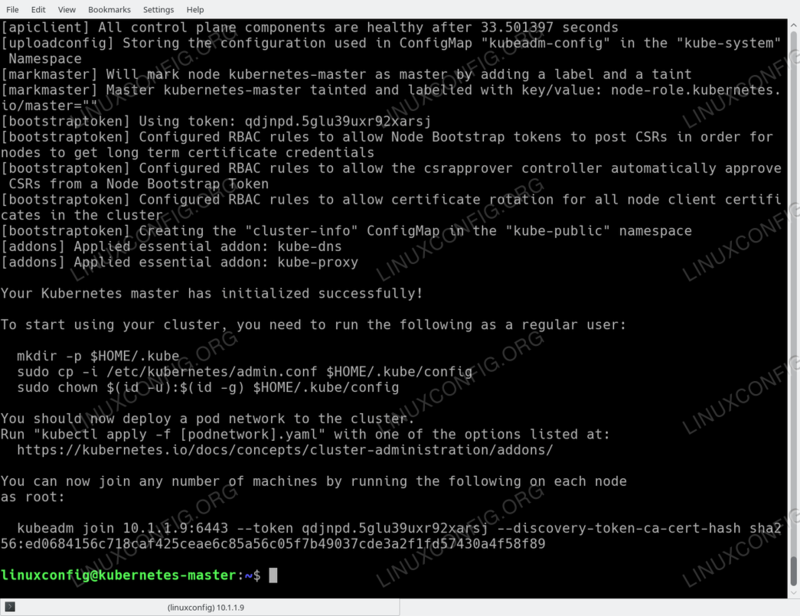 Take a note of the entire kubeadm join command from the bottom of the above Kubernetes master node initialization output as you will use this command later when joining the Kubernetes cluster with your slave nodes. Flannel pod network deployed. If successful, you should see your output similar to the one above. The slave node has successfully joined our Kubernetes cluster. List of all joined Kubernetes nodes. kubernetes-master:~$ kubectl run --image=nginx nginx-server --port=80 --env="DOMAIN=cluster"
New docker Nginx container is up and running on Kubernetes slave node.